Womer: ‘The community is kind of always changing. HAGERSTOWN, Md. — The building at the corner of West Antietam Street and Summit Avenue in downtown Hagerstown is not what it once was. 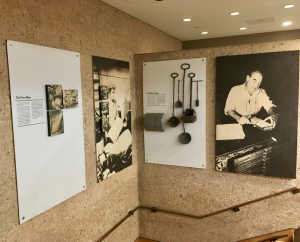 Inside the lobby of the sprawling Herald-Mail Media campus, life-size photographs serve as a museum of sorts, memorializing the people and the processes of what used to be. 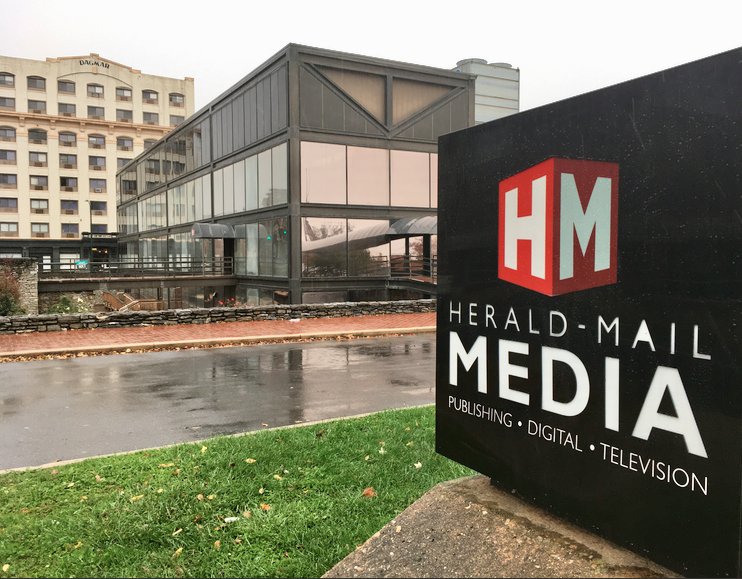 It is difficult to miss the Herald-Mail Media building, situated on the corner of West Antietam Street and Summit Avenue in downtown Hagerstown. And times, they are a changin’. There is no printing press forced into operation each night as the newsroom hits deadline. The Herald-Mail newspaper is now printed in Frederick. There is now a television studio on the second floor, home of HMTV 6. The Herald-Mail, owned by Indiana-based Schurz Communications, used to cover Frederick County, Md., but eliminated that coverage area to focus on Washington County, Md., as well as the Eastern Panhandle of West Virginia — Berkeley, Morgan and Jefferson counties — and Franklin and Fulton counties in Pennsylvania. 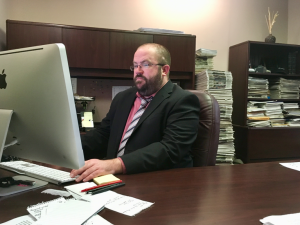 The HM used to have bureaus in Frederick, Chambersburg, and Jefferson County, but now “we just have some part-time reporters in some of those areas that work out of their homes,” said Jake Womer, executive editor. Womer is a newsroom veteran with nearly a decade in his current position and 15 years at the Herald-Mail. He’s seen newsroom cuts. 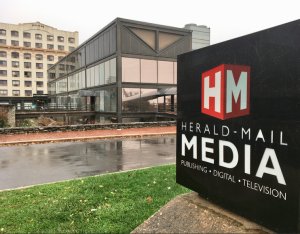 In the past week, the Herald-Mail informed members of its photo department, including two full-timers and two long-time part-time photogs, that the entire department (and their positions) have been eliminated. Even so, Schurz Communications remains, by most accounts, on the “nice” list compared to other corporate giants such as Gannett, Tronc, CNHI, GateHouse and others. A newsroom staff of approximately 30 full-timers and 15 more part-time personnel — including editors, copy editors, reporters, editorial assistants and more — work to support an average daily circulation of 23,180, a figure that includes both newsstand sales and subscriptions. Some things, though, never change. Speed matters. Accuracy matters. The Herald-Mail has fully embraced the 24-hour news cycle and is a 24/7/365 news operation. 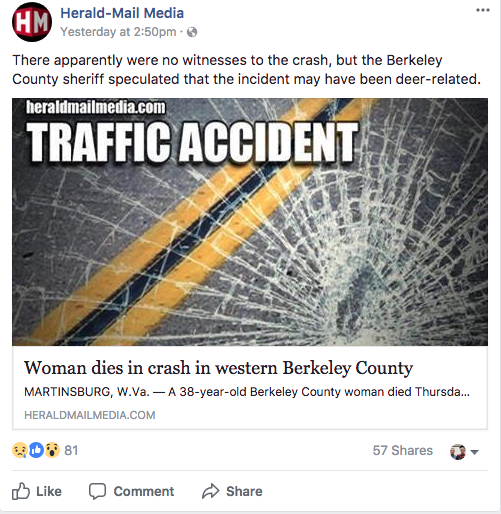 A fatal traffic accident in Berkeley County, W.Va., is worth reporting to all of the Herald-Mail’s readers. 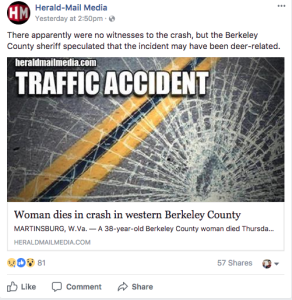 On a recent Thursday night, a fatal car crash in Berkeley County warranted a timely post online, and then, of course, shared on the HM’s social media channels. Regardless of where the readers come from, or how they consume Herald-Mail news — on social media, on the newspaper’s website, in print, or on HMTV 6 — there is a certain way to go about collecting the news, Womer said. Sometimes, adding that context can lead to mistakes. 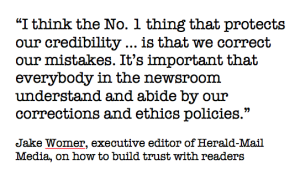 Womer said that’s where the Herald-Mail stands out with its strict corrections policy that involves at least two people, including at least a supervising editor, every time someone makes an allegation that the newspaper made an error. 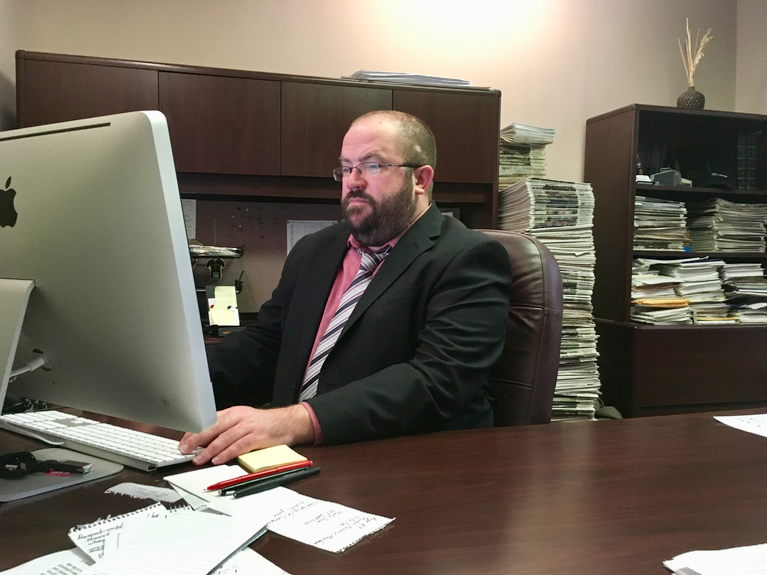 Jake Womer, executive editor of Herald-Mail Media in Hagerstown, oversees the day-to-day newsroom operations that includes about 30 full-time staffers and another 15 part-timers, with a circulation of more than 23,000. Instead, at least two people are a part of the decision-making process on whether or not an error was made and, if so, how to go about making it right. In addition, the Herald-Mail — more so than any other newspaper interviewed for this project — is proactive in reaching out to readers, often by way of opinion pieces, to explain the stories behind the stories. Opinion pieces are not the only way readers learn what’s going on within Herald-Mail Media. Womer said they have tried town hall-style meetings, with editors and reporters meeting up at a coffee shop in different coverage areas, as well as focus groups, in which readers are invited to weigh in on possible changes before they happen. There are a variety of ways online news sources attract and retain readers. Many of those outlets, however, have some sort of pay wall in which readers can access content only after paying to do so. Like many other dailies of similar size, including the Carroll County Times in Westminster and the Cumberland Times-News in Cumberland, the Herald-Mail has a metered pay wall. With a metered pay wall, readers can access a certain amount of stories per month before being forced to buy a subscription — or get their news elsewhere. Life-size photos inside the Herald-Mail Media lobby show the process of how putting together a daily newspaper used to look. “You gotta pay for journalism,” Womer said. “I don’t see too many models where it’s completely free, unfettered access to journalism, where it’s going to work. In that regard, yeah, I don’t really know what you can do for people” to ensure they have access to the news and information about events happening in their community. A metered approach seems to be an attempt to be a compromise between offering content free of charge and blocking reader access to any of it before receiving payment. 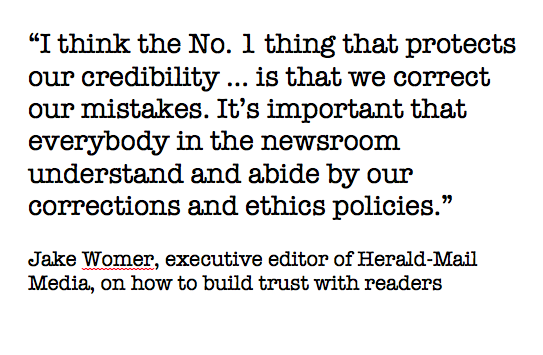 Womer said he was unaware whether or not Herald-Mail Media still participated in Newspapers in Education, a program in which newspapers sell advertising space to local businesses and, in turn, deliver a number of newspapers to school-aged children across the coverage area. Despite what national opinion polls seem to suggest, Womer insists his newsroom is not full of Ivy League-educated people who are not connected to the communities they cover. In the interest of full disclosure, Kevin Spradlin is a former employee of The Herald-Mail. He last received compensation of any sort from the company in 2012.